If you play a lot of softball like I do then you know how important it is to get in shape for the season. Softball isn’t a game where you need to be in awesome shape to do well at it (we are swinging at a ball going 6 mph) but it doesn’t hurt. Since almost nobody gets paid to play softball I feel if you’re gonna show up then you might as well enjoy it. We all have those teammates who only want to bat and need somebody to run for them or the guys who only want to play first or catcher. Unfortunately you can’t have an entire team built like that. I know I’m not the most in shape guy out there or can hit bombs every time I get up but what I want to talk about is the workouts you can do to get in shape for softball. My fielding at short stop and hitting have improved since doing these workouts. The way I designed this is to talk about what programs you need to start with in the offseason and move into the regular season. You’ve probably heard a lot about P90X and the success stories. The reason why you want to do P90X first is that it will bring your basic overall fitness up a couple of levels. If you put forth the effort with P90X and follow the meal plan you’ll completely change your body in 90 days. I put 10 pounds of muscle on with P90X in my first 90 days. Went from hitting pop ups to the outfielders to hitting the 300 foot sign. Chest & Back – Pushups and Pull ups to the max. You’ll develop a ton of upper body strength which will help you throw and hit harder. Shoulders & Arms – Develops the muscles that do so much of the work playing softball. Legs & Back – Lots of pull-ups that will help you hit bombs and leg workouts that will make your calves sore for days. Back & Biceps – More pull ups to make your back strong allowing you to make more bat speed when hitting. A ton of curls to get your arms big which lets you throw harder. Plyometrics – You’ll burn close to 1000 calories doing this workout. There isn’t a lot of cardio playing softball but this will help with your agility, jumping, and balance. All of which are important for any position. Yoga X – Everybody thinks that Yoga is stupid but what you don’t know is that Yoga is the workout that puts it all together. Yoga develops all of the connector muscles, enhances your balance, improves flexibility, challenges your cardio, and works your core. All of these moves will improve your swing, throw, cardio, and will reduce injury. Kenpo – Cardio workout that challenges your speed and balance. Core Synergistics – Works on everything from your knees to your chest. The same area where most of your bad speed comes from. Cardio X – Think of it as fielding practice. Ab Ripper X – Probably one of the hardest 15 minute ab workouts out there. So much of what you do in softball starts with the core. This works everything from your hips to your chest. Once you’re able to get through this you will notice faster bat speed, better throws, and more agility in the field allowing you to get to more ground balls. X Stretch – A lighter version of Yoga done in the recovery weeks. Chest, Shoulders & Triceps – Brutal workout designed to challenge your entire upper body. Get through this and most of the muscles you use to throw and hit will be in tip-top shape. In the end, P90X is designed to improve your function fitness, i.e to be able to move better and become more athletic. This is exactly what will happen at the end of 90 days. You’ll become a better athlete which will improve how you play softball. Making it through double headers or tournaments will be no problem because of your new level of fitness. Your strength, endurance, power, mobility, cardiovascular health, and muscle growth will all improve during P90X. Skinny guys will find new levels of strength allowing them to hit harder and move better in the field. Big guys who only hit bombs will continue to hit bombs but also be much better in the field with their increased flexibility and agility. I think if you could get an entire softball team to start P90X three months before the season starts that you will destroy your competition because of your teams overall level of fitness. Now that your base level of fitness is way up from doing P90X we now have to take it to the next level. Insanity is all body weight resistance training at a ridiculous pace. So whatever you weren’t able to develop in P90X will definitely be challenged with Insanity. There are tons of push ups, dips, and shoulder moves so you won’t have to worry about losing the muscle you built in P90X. 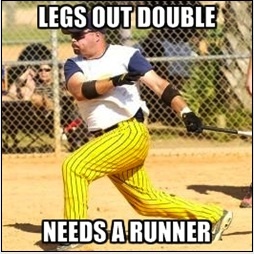 The cardio will get your legs into shape which will help running around the bases and tracking down fly balls. All of the workouts have a ab session that challenges your entire body. You’ll be lucky if you can make it through an entire workout. I leaned out the muscle I put on with my Insanity results. You’ll be needing to eat more to have the fuel to make it through a workout and play softball at night. You may notice a little decrease in your back strength due to the lack of pull ups but it shouldn’t affect how hard you hit or throw the ball. Going from first to third on a ground ball or going for a double can now be done as you’ll be faster. It’s a 60 day workout so you should be half way through the spring season when you finish. You’ll be in playing and Insanity shape with two months to go. By this time your probably in the best shape of your life. You’ve finished P90X and Insanity in the last 5 months. There are 6 weeks left in your spring season and its time to help your team make the push to winning the division or tournaments. What the Insanity Asylum workout will do is put everything you’ve done with P90X and Insanity and mash them together. Back comes the pull up bar and the dumbbells along with a jump rope and agility ladder. Each one of the Asylum workouts is kind of like a game in itself. The moves are quick and challenging. The things that will greatly improve (again) are your back and core strength and especially your footwork. The agility ladder and jump rope moves that Shaun T has you doing are brutal. If you play infield then you will notice a dramatic improvement in how fast you can get to a ground ball or even track down some of those bloops that used to drop in behind you. It’s only a 30 day workout so you should be finishing up right at the end of the spring season. The results I earned from Insanity Asylum put me in the best shape of my life. I could not have gotten there without doing the previous workouts too. We all know how common it is to have a beers and pizza after the games at the bar. If you play a couple of nights a week and on weekends that really adds up. Do your best to watch portions and take snacks with you. My routine is to have Shakeology in the morning (everyday) to provide all the nutrition I need for the day, bring a P90X Protein Bar to the game to have in between double headers or afterwards in the bar besides pizza, and have one scoop of P90X Recovery Drink after the game to help reduce soreness. It’s really easy to lose all of your results from working out on the food and beer so keep it in the back of your mind. The workouts I listed above will help anybody with their softball game. The order I suggested in doing them is how I came across them. So if you think you want to move them around then do so. Not everybody is built the same so you might want to work on speed over strength first. I was very skinny before starting P90X so it worked well for me. If you feel like you can get more out of the program before moving on then do so. What I can tell you for certain is that my ability to play softball has greatly improved since doing these workouts and taking the supplements with it. It’s also more enjoyable to play. If you’re ready to start one of these programs then go to the Beachbody store or create a free Beachbody account and do some research. If you have questions about the workouts and what you’re trying to do to help your fitness level with softball then please leave a comment.